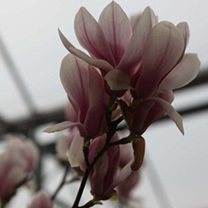 lba Superba is a popular variety of magnolia that can be grown as a shrub or a small tree. Pure white, fragrant goblet-shaped flowers are produced from mid spring and are flushed pink at the base. Extremely hardy and easy to grow. Height 301cm+. Supplied in a 3 litre pot.